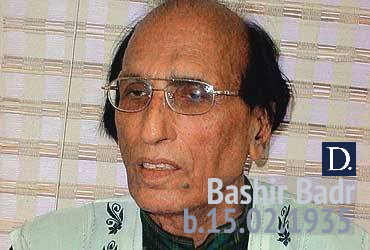 Born on 15 February 1935, in Faizabad, India, as Syed Muhammad Bashir, Dr Bashir Badr is an eminent Urdu poet in India. 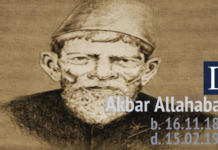 He is an alumnus of Aligarh Muslim University. He is married and has three sons Nusrat Badr, Masum Badr, Taiyeb Badr and a daughter Saba Badr. He lived in Aligarh university area during student time and teaching time. He also lived in Meerut, U.P When his house was burnt in riots. He lived in Delhi for some time and then permanently relocated to Bhopal. He is currently suffering from dementia and doesn’t seem to remember his Mushaira years. 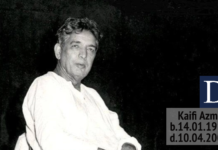 Badr has written many Urdu ghazals. 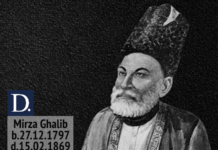 He has also worked as a chairman of the Urdu Academy. Badr has received the Padma Shri award in 1999 for contribution towards literature and Sangeet Natak Akademi Award. He has also received the Sahitya Akademi Award in Urdu for his poetry collection “Aas” in 1999.